The Grade 1 listed Holy Trinity Church is located within the village of Sunningdale in the Royal Borough of Windsor and Maidenhead. Church architects Acanthus Clews were appointed by the church to explore the possibilities for improving both the facilities on offer for the community and the functionality of the church internally. 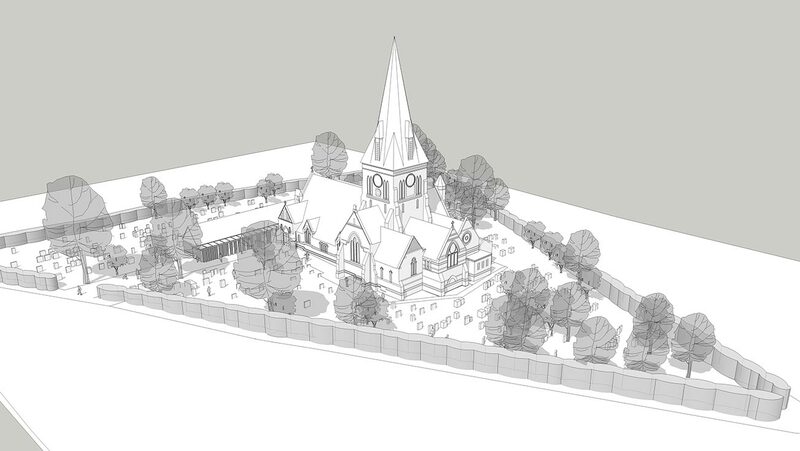 Following a detailed feasibility study it was concluded that reordering and extending to the west of the existing church was the most effective way to provide the necessary space and facilities required to support a growing church, and serve the long term needs of the local community. The new extension contains a new flexible hall with a community café hub space that links back into the nave of the church where pews will be removed and new flexible seating provided. It is intended that the impact of the new extension on the existing building and churchyard will be kept to a minumum to ensure the historic significance of the listed building will not be compromised. The use of red and blue brick, limestone dressings and flint detailing on the extension addresses the sensitivity of the context and large areas of glazing express the community function of the building through its transparency.